Please take a moment to browse our current truck service promotion. Contact Tri Truck Centre to book a service appointment with our well trained professionals today! 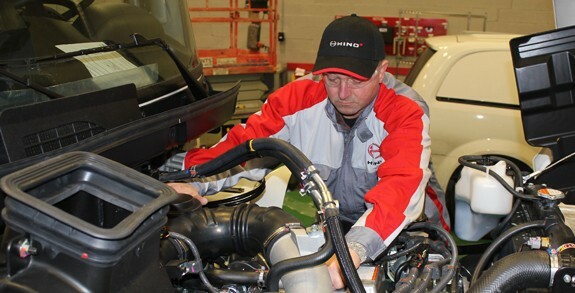 You can save on the labour cost of your annual commercial vehicle inspection when you combine it with a "B" Service at our Tri Truck Centre service department in Barrie. Contact us for more information! When you buy any parts for your Hino trucks at our Tri Truck Centre dealership in Barrie, you have peace of mind that it comes with a 3 year parts warranty. Contact our parts department for more information, or come to our dealership today! Want no-charge brake pads? When you get a new set of Hino brake pads installed on any truck model that is a model year 2011 or newer, you receive the brake pads at no-charge. You can also get a free 30-point inspection when you purchase a set of Genuine Hino brake pads or shoe replacements. Contact our Hino truck dealership in Barrie for more information.